WhatsApp chat message bubbles show check marks and a clock icon. Learn the meaning of these single tick, double tick and clock icon. These tiny icons convey important information about message delivery. You’ll gain the understanding on chain of events that occur when you send a message on WhatsApp. WhatsApp is being used by millions of users and its usefulness can easily be underscored by the fact that Facebook bought it for a mind-boggling sum of $19 billion. Most people are pretty comfortable with the simple user-interface of WhatsApp —but a few things keep some of the users guessing. For example, appearance of single tick, double ticks (also called check marks) and clock icon on the sent message bubbles are mysterious to a number of people. Let’s understand what these ticks (check marks) and clock icon mean in WhatsApp. When you send someone a message through WhatsApp, in the first leg of journey, the message travels from your mobile phone to the WhatsApp server. By the way, did you know that now WhatsApp can also be easily used on a desktop or laptop computer? When a single tick gets displayed in the bottom-right corner of the message chat bubble, it means that the message has reached the WhatsApp server. This tick icon is displayed as an indication for the sender that the message had successfully delivered by sender’s mobile network onto the WhatsApp server. More Interesting Stuff: Great one line status messages for WhatsApp. Arrival of your message on WhatsApp server is only half the journey. After getting the message, WhatsApp server sends it to the receiver’s mobile device. When message gets delivered to the receiver, the single tick icon turns into an overlapping double tick icon. WhatsApp tick marks convey important information about your message. Double tick indicates that your message has reach the receiver’s device —this however does not mean that the receiver has read it. Reading of a WhatsApp message is shown by blue tick marks. You may get a rough idea whether the receiver has read your message by seeing his “Last seen” timestamp. But remember, there is a way to hide the last seen timestamp. If the receiver has chosen to hide his “last seen”, you will not get information on when he was last online. As soon as you send the message to someone on WhatsApp —you may sometime see a clock icon in the bottom-right corner of chat bubble. This icon means that the message is still waiting to leave your mobile device. It means that the message has not yet begun its journey to WhatsApp server. Clock icon usually appears when the network connection is slow. It is an indication that the message is waiting in your phone and as soon as WhatsApp will get mobile Internet connectivity with enough bandwidth —the message will be sent over to server. Sometimes clock icon sticks on and refuse to go away. It simply suggests that something is wrong somewhere in the network path. You should check your internet connection, if the clock icon has been there for quite some time.By the way, this is good time to act if you realize that you have sent the message to a wrong person! 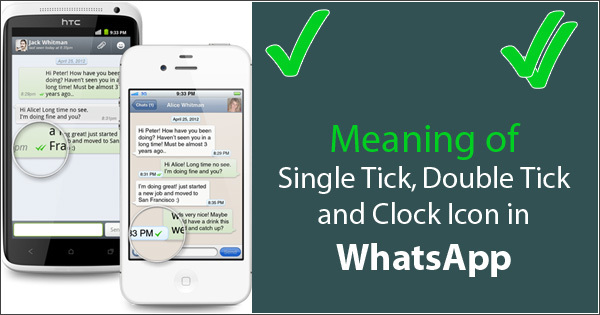 If clock icon changes into single tick, then you will not be able to stop a WhatsApp message. As soon as the network will allow message to reach the server —clock icon will turn into single tick. Thereafter, single tick will change into double tick when the message will reach the receiver’s phone. What if No Icon Appears at All? If no icon appears in the bottom-right corner of the message bubble, the reasons is that your internet connection is not working. Check it out! This was the story of WhatsApp tick marks. But in case you were actually looking for the meanings of WhatsApp smiley and other symbols, I have written a separate article for that too. I hope this solves the mystery of single and double check marks as well as the clock icon in WhatsApp. Let me, please, know your comments on this! I SEND WATTSUP TO MY HUBBY FROM MALAYSIA. NOW HE CURRENTLY AT HYDERABAD, INDIA. What is the meaning of a grey symbol that looks like a loudspeaker, or a desktop from the side? How is it possible that the receiver reply my massage but my massage which I send is still double tick but without blue mark? thank you for the info on the clock but i’m a little confused as to why only some of the messages have the clock and others don’t. is it the other persons connection or mine? Thank you very much sir, for enlightening me on a number of issues regarding whatsApp. I had most of these questions answered here trouble my mind, but hey, am happy now I know. Keep it up with your good works sir. A friend of mine says someone sends him a rude text message while he was having text conversations with his friend. He switched off the phone and restart later only to find that rude message has gone missing while other messages remained. Is it possible for that sender to recall such a text message already read? When i send message to friend i get two grey ticks. I understand what that means, what i don’t understand is why they are getting it even though their phone is switched off… we did a test and always getting two grey ticks. Are you able to provide any ideas? We would have expected only a single tick. Hi James, I am sorry I can not offer any explanation for WhatsApp showing two grey ticks even if the recipient’s phone is switched off. It is not supposed to happen! Hi Mark, if the latest WhatsApp messages sent by you are showing double blue ticks, then it is safe to assume that all previous messages have also been delivered and read. I have noticed that sometimes, WhatsApp fails to update the delivery and read-receipt status of some of the messages sent. Nice more explanatory than the whatsapp website thanks for putting me through Lalit Kumar. Sir, I sent one picture to a wrong recipient. It showed only one tick. Then I deleted that message. I want to know whether that person will receive this message when she turn on her internet or not? Most probably, the message will be delivered to the recipient because the message has left your phone and now residing on the WhatsApp server. Hello. Last night I had sent few messages to a friend. It showed me only one tick. And later I deleted the chat. Next morning she denied said no messages received at all. How is that possible. Her phone was switched off at night. Is it by mistake I have sent it to someone else. Or message have not passed at all. Well, there could be any number of reasons. Your messages might still be on WhatsApp server, your friend’s Internet might not be working, your friend missed the message etc. And technology itself is not fool-proof. We must trust our beloved more than the technology. ohh lalit kumar is romantic too ? What could be the reason if suddenly blue tick is not coming only for one contact? For all other contacts I see do blue ticks. Hi Ravi, most probably, that contact has turn off the WhatsApp Read Receipts. An icon Star now appears next to the icon that check whether my message has been received and read. This star icon represents the bookmark status of the message. I sent something to the wrong person, it had the clock sign and my WiFi was still on but I deleted it, will the person see it? If the WhatsApp message was deleted when it showed clock icon, the message will not reach the recipient. If the message showed a single tick while sending offline by mistake, then I erase it before I went online again,will the message be delivered? In all probability, yes message will get delivered. Sir, while I send message to my friend I got double tick with blue colour. But one particular number I getting double tick only grey colour. I also get reply from my friend. What is the reason? It sometimes happens that WhatsApp server is not able to convey read receipt of a particular message to your mobile phone. If latest message has blue ticks, then you can assume that all the older messages have been read. Sent a message last week still showing as one grey tick even though they have been online since. Can see last seen updates and picture. Have they seen message or not? If you’re sure that the receiver has since been online, chances are that your grey tick is just “stuck” (haven’t got updated) and the receiver has already seen the message. I have a contact and now their picture and status have gone. Also there is no last seen . Have they just changed their privacy settings? Also how would you know if someone had blocked you? Hi Amanda, Last Seen status can be hidden by changing settings in WhatsApp. But one can not hide their profile picture and status. If you don’t see someone’s profile photograph and status —the reason could be that the person has removed photo and status. The other possible reason is that s/he has blocked you. There is no sure-shot way to say that someone has indeed blocked you on WhatsApp. you have to wait and, wait some time, and check that, if the person is shown to you online. then you are not blocked. he/she just changed the setting of his whatsapp, but if you could not see him/her online that means you are blocked. It is very thoughtful of you to educate us regarding these terms and helping us understand the different aspects of whatsap in a simple and helpful way. When my articles turned out to be useful for my readers, I feel that my work is valuable. Irwin, thank you for your words of appreciation. Simply explained and you have cleared my doubts. That is the system. A system is to be foolproof. Lengthy explanations not required. That will create more problems than solving. You’re welcome Rajeswaran! Looking forward to hear more from you on TechWelkin. I can see only one tick for along time in my WhatsApp. What is the reason? One of the possible reason is that the recipient’s mobile phone is switched off OR that person has not connected to Internet for a long time. I am unable to get my WhatsApp message delivered to recipient. Can only see a single tick next to my message. But picture can be sent across. Able to see double tick and double blue tick. Can see the recipient online too. Recipient also cannot send message to me but can send to others. Am also facing the same problem. Why? Well, it’s strange. All I can suggest is a complete reinstall of WhatsApp. It might solve the issue. Sir, earlier when i sent msg it shown single tick but after one week it is again showing clock. What does that mean? Vaishali, it means your WhatsApp is confused because of some technical problem. Such behavior is unexpected and therefore no simple reason can be given. Very good and valuable and useful information. Thank you, AR Raman! I happy that you found it useful. Stay tuned for more interesting articles!